Yes, I understand it's almost mid-August and this post is late. My excuse: I've been doing a miiiiiiiiiiillion and one things, and now my evenings have calmed down. Just a touch. Sooo I've been excited to show my favourites that I've been using for the month of July. Especially since I used most of these products when I was travelling. 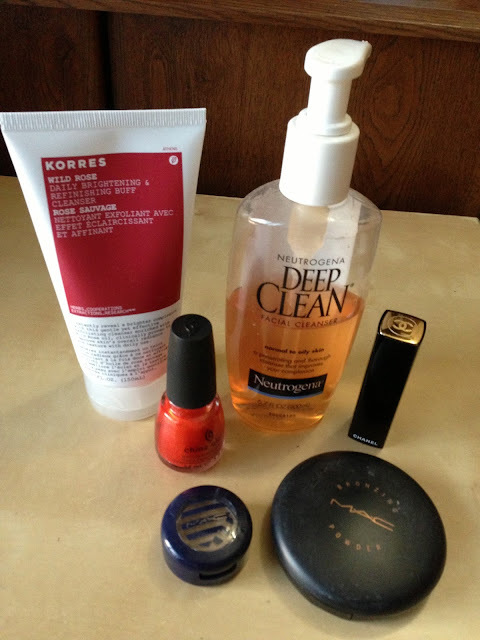 Korres Daily Brightening and Refining Buff Cleanser, Neutrogena Deep Clean Cleanser, China Glaze nail polish in Riveting, Chanel Rouge Allure in 104 Passion (Red), MAC eyeshadow in Barefoot, MAC Bronzer in Matte Bronze. Neutrogena Deep Clean will always be a staple cleanser in my skincare routine. It's a cleanser that works well for combination skin and it doesn't strip me completely of hydration but it also prevents pimples from forming with regular use. Korres Daily Brightening and Refining Buff Cleanser is a exfoliating cleanser that can be used daily but I typically use it 4-5 times a week as a gentle exfoliator. I absolutely adore this because it makes my skin so smooth and it really does brighten the skin! 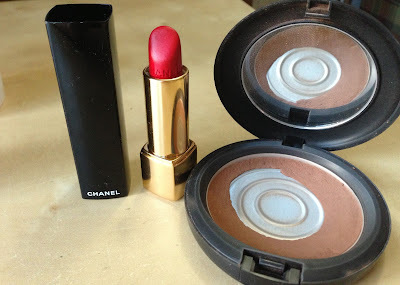 MAC Bronzer in Matte Bronze is also a regular but trusty staple bronzer. I've hit pan already but since I use only a little bit, it lasts a very long time. I found Chanel Rouge Allure in 104 Passion on Rue Cambon, of course, a classic red lipstick found on a classic Parisian street. The entire day and night of wearing this, my friend who was with me just couldn't stop complimenting the colour! Win! MAC Barefoot eyeshadow is just a great golden shadow to use daily as an all over lid wash or as a base colour. I love this eyeshadow with some black liquid liner and red lipstick. Voila, Old Hollywood Glamour! 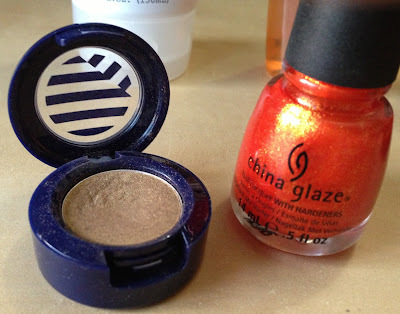 A typical summer colour, China Glaze in Riveting is my favourite nail polish for my toes during the warmer months. With a tan, the colour really pops and I cannot seem to get enough. I've gotten a few more things lately that I'm so excited to try and review for you guys! What have been your favourite beauty products this summer? I'm an all MAC girl except for the occasional dabble in Chanel. I love their products and just feel like you can never go wrong! Thank you! And sure, following you via bloglovin :) ! !